One of the most important lessons new chief petty officers learn each year is to trust the Mess. In very real terms, it means trusting their fellow chiefs to support them in their new duties. They also learn to trust other Mess members to accept them for who they are—their strengths, weaknesses, and imperfections—regardless of what they might try to hide. This crucial step toward being accepted into the Chiefs’ Mess is often the most difficult; it requires courage to exhibit blind faith and emotional release. This does not mean revealing all their life’s experiences, but it does mean letting go of the emotional scars that inhibit trust and true interpersonal connection. New chiefs experiencing the most difficulty will often hear a seasoned chief petty officer speak in emotional and honest terms about themselves. Sometimes, chiefs will even lay bare their souls to a selectee. In doing so, they demonstrate that honest emotion is a strength, and the CPO Mess is a place where honesty rules, weaknesses are discovered, and acceptance is given. I witnessed just such an experience this year. Faced with a chief-select unable to connect with or show his emotions, a chief petty officer decided to share his personal story. What took place was more than a simple demonstration of trust; it was inspiring. What amazing courage for someone to bare his soul to another, but he trusted those around him, including that would-be chief. He is an inspiration not just for his honesty but also because of who he is today and what he overcame. That chief petty officer, a young man by most standards, had endured hardships the rest of us could not comprehend. He not only persevered, he flourished. He did not let the experience of his youth dictate who he would become, and he made liars of those who said he would never achieve anything. Rarely do we see inside another person’s soul, but this chief’s story is an example of countless other sailors and Marines, officers and enlisted, who exist among us. People young and old who have faced great hardship; many have overcome, some still struggle. And this event offers important lessons. First, be careful judging others before you truly know them. Everyone is fighting some personal battle; many have faced extremely difficult obstacles in life. Second, military training should be gut wrenching; it is through challenge and adversity that we find our true selves. Training for new chief petty officers must create opportunities for building trust and newfound personal awareness. A visible transformation takes place in many selectees each September, and it is unfortunate that the small minority who did not experience it, or who had an otherwise poor experience, continue to push for changes that eliminate these moments. Third, heroes come in all shapes and sizes and are heroic for a variety of reasons. The subject of this article is one of them. He is a hero because he overcame adversity and does not hide those things that molded him into the man he is today. I’m happy he is leading young men and women and is a role model for junior personnel, especially minorities and victims of abuse. I’m proud of him because he was victimized, but he is not a victim. He was abused, yet he is gentle. He was belittled, but he is compassionate. He was humiliated, yet he is proud. 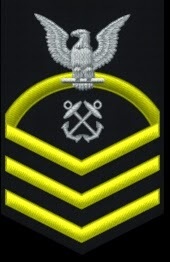 He is a chief petty officer. U.S. Navy (Michael Sherman) - Trusting their fellow chief petty officers is one of the most important lessons a new chief must learn, according to the author. Here, chief selectees Gregory Cunningham (left) and Noah Correll help fellow chief selectee Joselin Cruzdelossantos over an obstacle during CPO365 Phase II training at Camp Blanding Joint Training Center in Jacksonville, Florida, in August.